The Western Bay Surfing Champs took place at Mount Maunganui’s Main Beach. The interschool event, originally planned to be held at Tay Street, consisted of both boys and girls competing in u9, u11 and u13 grades. 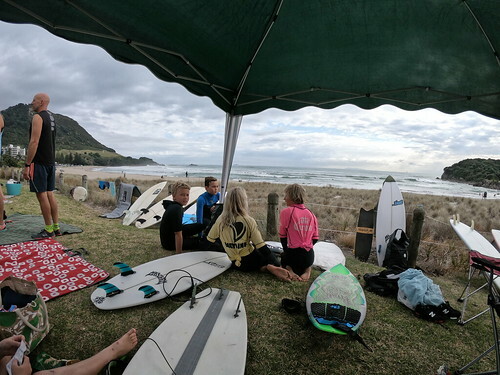 Overall, 49 boys and 17 girls from 19 different primary and intermediate schools across the Western Bay of Plenty had an awesome experience, surfing in favourable conditions and representing their school. Throughout the day the kids were in and out of the water, surfing in heats, paddling or getting pushed into waves, cheering on their mates, and stepping out of their comfort zone. All competitors had a great day and couldn’t contain their enjoyment. Huge thanks to Darren Royal (Kura o Matapihi) and Darren Kiwi (Te Akau ki Papamo & Bay Boardriders) for organising the day! Also a huge thanks to Khan Butler and Mount Maunganui College students for providing the judging and water support. Lastly thanks to our sponsors Backdoor and RPM.